We have had the privilege of working with local luxury apartment developer, Preferred Living, since nearly the very beginning of Crimson. Preferred Living provides an elevated living experience notable for its rich and masculine elements, reflecting the feel of high-end boutique hotels. Within the past few months, Preferred Living broke ground on Belmont House, one of their newest luxury apartment developments. Currently, Belmont is in the construction phase and the company hopes to open in Fall of 2019. In this blog post, learn about the challenges and solutions involved in creating a space that makes Belmont distinct from Preferred Living’s other multi-family housing spaces. Also, join us for a “tour” of the design vision! Preferred Living is unique in their commitment to continually elevating their design and brand aesthetic. A lot of luxury living developers tend to find something that works and then stick with it. While these spaces are beautiful, they aren’t always exciting. Preferred Living strives to offer a consistently exclusive experience in each one of their spaces. We’ve loved being Preferred Living’s design partner and helping to define their brand aesthetic over the years. All Preferred Living spaces share a similar foundation: traditional elements, a layering of textures and patterns, and distinct objects. However, each space needs to be memorable; each space needs to take the design to the next level. That’s where we come in. As our lead commercial designer, Esra knows all too well the challenges of creating a wholly unique space. “Every year it’s a new challenge. We have this brand that we’ve built, but we don’t want to present them with the same design over and over. We want to keep elevating the design and show them refined pieces that still fit their brand. And that’s what Belmont is: a fresh take on the Preferred look. I typically flip through a magazine or check out local spots and see what really stands out. The elements that pop really start to form my inspiration”. Then comes the challenge of taking that inspiration and developing it into a fully realized, one of a kind design. Esra accomplished this using two specific elements: customization and color. Esra stumbled upon an image which ignited her vision for Belmont House. She was drawn to the rich greens, natural yellows and traditional arches of the space. From this photo emerged the idea of a lighter and younger take on a traditional space, with art deco elements. After seeing the image that inspired her, Esra decided to use traditional greens with pops of mustard throughout the space. We’d never used this color combination in a Preferred Living project before, as we typically use blues and grays. These colors made a lasting impressing on Esra, the emerald green is dramatically elegant while the mustard adds a playful pop of color. From these two colors she built a palette which included other rich accent colors like crimson pomegranate and navy blue. 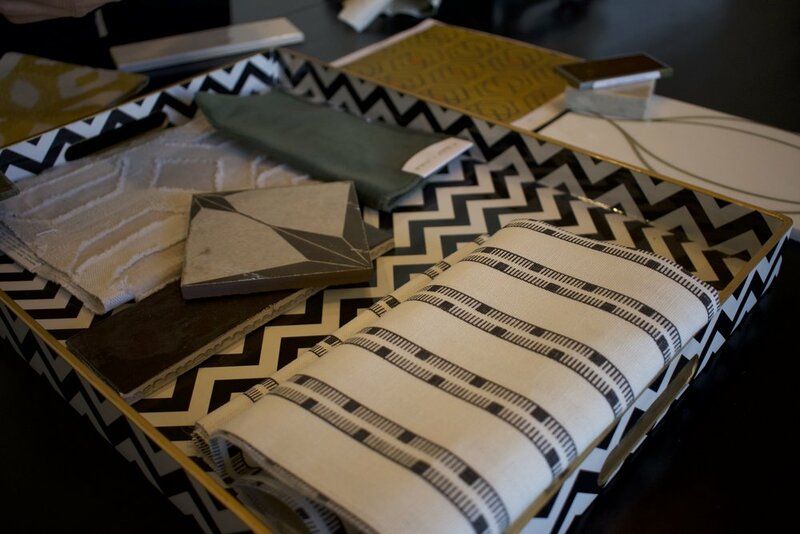 She ordered in a variety of fabrics, wallpapers, and materials. 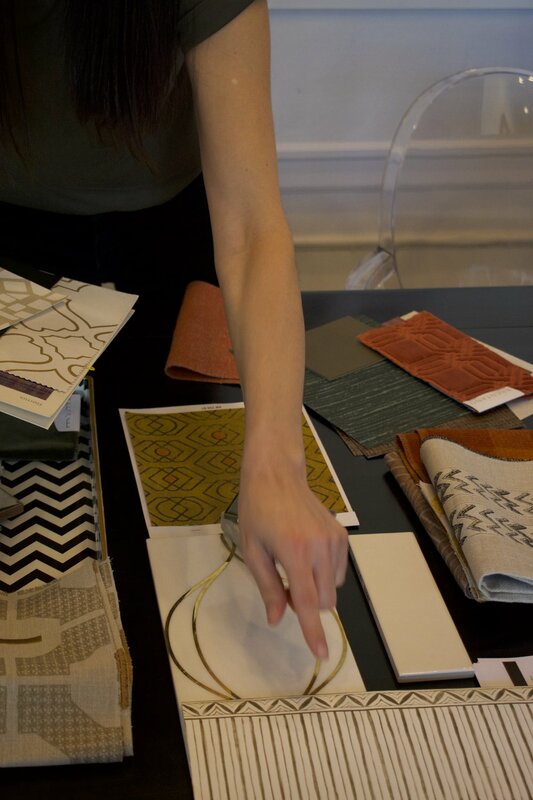 She and the other designers began to layer these curated materials in order to see how the colors and patterns would play off of each other in a finished space. It isn’t necessarily the colors the designer uses, but howthe designer uses those colors that can make a space timeless and, at the same time, fresh. As Esra explains, “It’s about taking colors and patterns that are funky and pop and mixing them together to create an elegant and elevated space”. The other element that makes a space stand out from the rest is customization. Belmont House features a plethora of beautiful custom pieces. From the art deco arches dispersed throughout the space to the applied mouldings, making an appearance on even the bathroom walls, no surface is left untouched. Beyond these architectural details are upwards of 15 customized pieces including a bar, private seating areas created by Fortner Fine Living and Mark Metal Works, upholstered leasing office desks by Fortner, and a grand focal wall. Join us on a tour of the soon-to-be build clubhouse. The grand entrance of the Belmont clubhouse introduces visitors to the opulent space that lays beyond the foyer. As you first enter, your eyes will be drawn to the grand two-story wall. This wall, punctuated by a beautiful grand staircase and five arches, is made of a lighter wood, accentuated with various applied mouldings. On the walls leading up to the grand wall will be beautiful hand-painted murals by our favorite artist, Sarah DeAngulo Hout! With detailed, hard-lined black and white murals of nature scenes, Sarah will create a modern take on a very traditional and romantically elegant concept. As your eyes wander from the grand wall to the beautiful murals, they will drift upwards to art deco-inspired gold chandeliers that contribute to the traditional feel of the space. 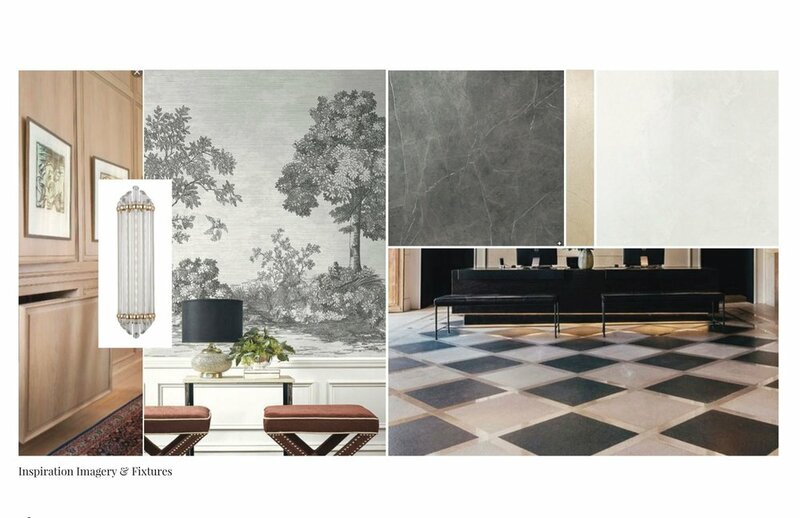 Balancing these glamourous chandeliers is a contemporary floor: a checkerboard marble, designed in creams, whites, and softer grays, to create a softer version of a more classic flooring concept. Finally, your eyes will settle on the entrance to the leasing office. The framed entrance to the leasing office looks like it was salvaged from a historic mansion. This dark, distressed, and ornate entryway leads into a high-gloss, emerald green room featuring gold accents. The emerald green paint is applied atop decorative wood trim, creating a space full of substance and gravitas. The checkerboard tile in the grand entrance, paired with the wallpaper on the ceiling (yes, on the ceiling), balance the weight of these walls. The wallpapered ceiling draws inspiration from a classic color palette by incorporating black and white striped starbursts overlaid on a cream backdrop. These elements, combined with custom leather-wrapped leasing desks, create a modern elegance that is sure to leave an impression. The leasing office’s design is in conversation with the two dark green, customized seating areas on the 2ndfloor. Through the upper arches of the grand wall, these moody seating areas provide a beautiful contrast to the lighter, glamorous Grand Entrance. 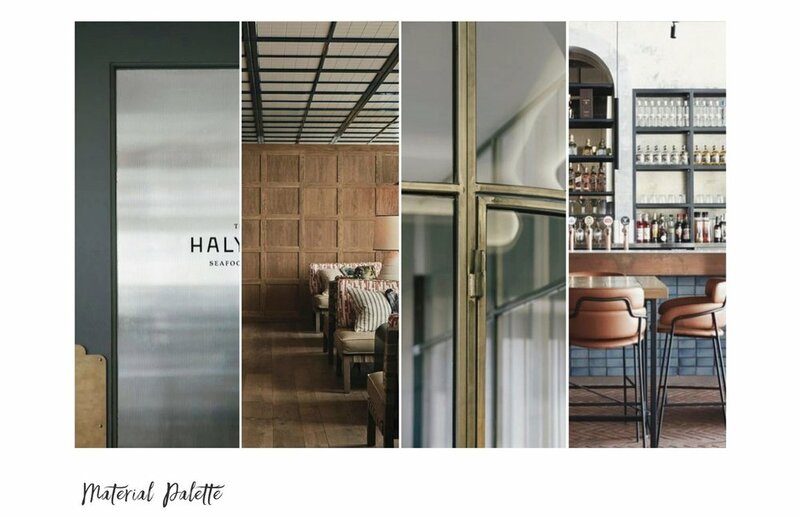 Customized, decorative trim is found on the half walls of these spaces, topped with a stunning combination of metal and glass. Esra loves how this combo not only adds to the space’s masculine feel, but also provides a cozy space, a non-negotiable for the Preferred experience. Finally, these groupings are draped with fabrics and materials that reflect the golden hues and vivid greens of the clubhouse’s overall design, while creating a versatile space for tenants to use and live in. The pièce de résistanceof the clubhouse is the bar…which will be covered in rugs. This is yet another custom piece that makes Belmont such a distinct space. 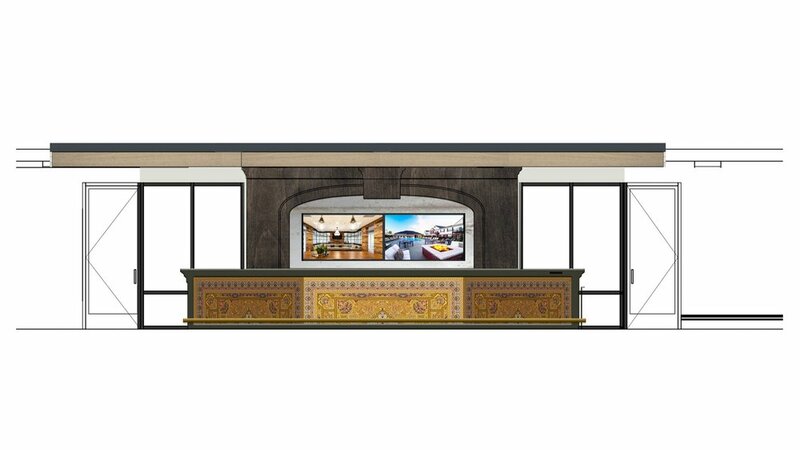 The front of the bar will be lined with colorful, intricate rugs that harken back to traditional design, but will be used in a forward-looking, modern way. The bar’s design also features rounded edges that echo the many curves and arches which are sprinkled throughout the entire Clubhouse. “Belmont has a floorplan that we’ve never worked with before. I think the two-story entrance is going to make such a statement that I can’t wait to see. On top of that, this space has so much cool tile, custom woodwork, ornamental wallpaper and so many beautiful light fixtures.” We can’t wait to see this design come to life, either! Do you want to see other works in progress? Check out @crimsondesigngroup on Instagram to see photos of ongoing projects! 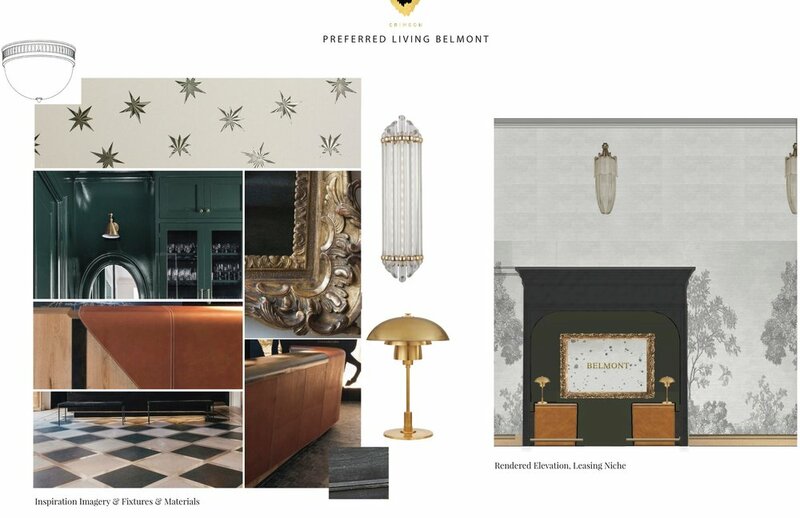 Be sure to keep your eye out for our follow-up blog in Fall 2019 to see how the Belmont design came to life!